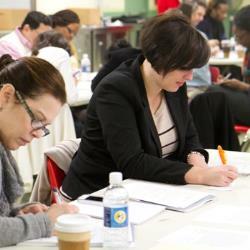 Lend your language skills and help interpret for legal screeners at the Immigration Court! Spanish needed. 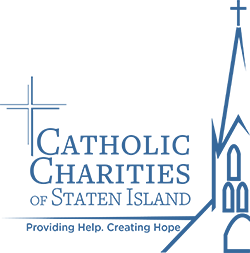 If you are interested in screening prospective clients, please register here: http://www.catholiccharitiesnyvolunteer.org/HOC__Volunteer_Opportunity_Details_Page?id=a0C0W00000vORjN If you have not yet registered to volunteer with Catholic Charities, you will be prompted to create an account first. Please note: once completed, you will need to sign up for this event by selecting the "sign up" button under the shift you desire. If you do not have immigration legal experience, please make sure you have attended a training in the past or have volunteered previously with this program. Dedicated and personable volunteers are needed for information gathering and legal screenings for people with hearings at Immigration Court. You will meet with prospective clients, gather information about their journey to the United States, their life histories, and work with Catholic Charities attorneys to inform immigrants about their rights and legal options. If you are bi-lingual and interested in interpreting ONLY, please register here: http://www.catholiccharitiesnyvolunteer.org/HOC__Volunteer_Opportunity_Details_Page?id=a0C0W00000vORiI If you have not yet registered to volunteer with Catholic Charities, you will be prompted to create an account first. Please note: once completed, you will need to sign up for this event by selecting the "sign up" button under the shift you desire. Volunteers are vital and join staff in the steady heartbeat of programming that Encore Senior Center provides. Volunteers come from all age groups, assist in all facets service delivery, and are instrumental in combatting the social isolation that many members would otherwise experience. Many volunteers are older adults themselves who recognize the need in their peers, and the opportunity to give back to their community. 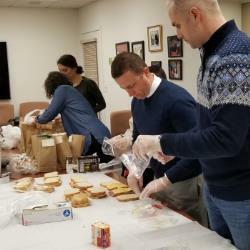 In addition to serving a sit-down lunch for members we need assistance specfic to our meals on wheels program benifiting our more frail and isloated older adult members: Meal packing – Volunteers assist by putting together cold components ‘coldpacks’ for home delivered meals.. This is a great *family friendly*volunteer opportunity -- all ages welcome! Help us deliver meals on foot to seniors in the midtown Manhattan area. Bring the gift of a delicious and nutritious meal, and provide homebound seniors with some company and a bright smile. Encore is located in Midtown West. 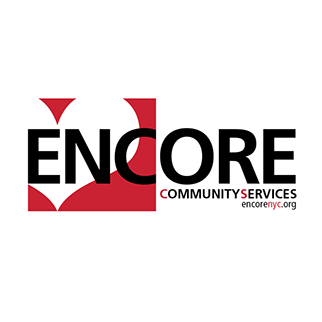 Encore Community Services provides care and service to older adults living in the Clinton/Times Square/Midtown communities, and to any older adult person who visits its senior center. Thank you for your interest in volunteering with Catholic Charities and our Federation of 90 Agencies! 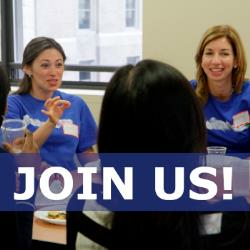 Come join us for an orientation session at our HQ in Midtown East (1011 First Avenue) to learn more about the history of Catholic Charities, the vast number of services we provide to needy New Yorkers, the variety of volunteer opportunities we provide, some guidelines and expectations for how to excel in your new role, and more! This is also a great opportunity to meet some of your fellow volunteers and meet the Volunteer Services Team. We look forward to having you join us! If you would like to attend an orientation but are unable to do so because of time/location concerns, please email us at ccvolunteer@archny.org. Do you want to get a taste of what it's like to work with the Junior Board? The Midnight Run is a great and casual way to get to know some of the Junior Board's members -- you can ask questions, make new friends, and help needy New Yorkers. And thankfully, the Midnight Run doesn't happen at midnight, nor does it involve running! It's easy! Where: 1011 First Ave b/w 55 and 56 street. When: Every 2nd Wednesday of the Month Time: 7:30pm What you'll do: Volunteers bring in an item of food (assignments are emailed beforehand - maybe a loaf of bread, a box of snacks, some sliced ham or even a package of napkins), and then quickly assemble lunch bags filled with sandwiches and juice boxes (the whole process is done in a speedy 20-30 minutes!). Completed lunch bags are divided among volunteers and each volunteer is free to distribute them to the homeless on their way home. 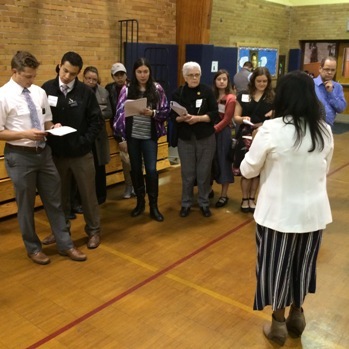 The Catholic Charities Junior Board introduces young professionals (ages 21-40) to the wide array of programs and works of Catholic Charities through volunteer opportunities, social gatherings, faith-based events, and philanthropic support. The Junior Board helps cultivate the next generation of leaders committed to Catholic Charities to serve those in need in our community. Please join us for a special event with Viacom- Viacommunity Day! Spanish speaking volunteers are needed to interpret for information gathering and legal screenings. You will meet with prospective clients, gather information about their journey to the United States, their life histories, and work with Catholic Charities attorneys to inform immigrants about their rights and legal options. Two shifts are available 9:00am - 1:30pm and 1:00pm - 5:30pm. Sign up for one shift or both! 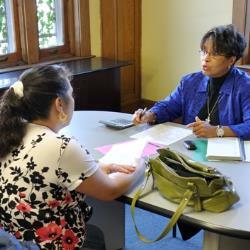 If you have not yet registered to volunteer with Catholic Charities, you will be prompted to create an account first. Please note: once completed, you will need to sign up for this event by selecting the "sign up" button under the shift you desire. The Meatloaf Kitchen, located in the East Village, serves warm meals of meatloaf to the hungry in New York City. 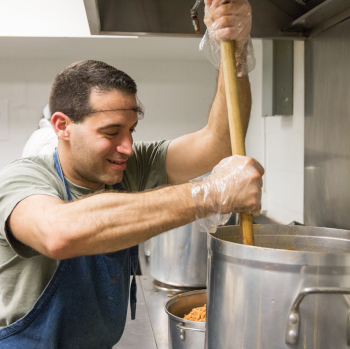 There are two shifts available: First Shift: 8am-12pm for food preparation Second Shift: 11:30am-3:30pm for greeting guests, serving food, and clean up! Note: Volunteer hours are not recorded for this activity. We need volunteers who are able to interpret at asylum interviews for unaccompanied youth (ages 5-18+, primarily from Central America). We are looking for individuals who are: fluent in English and Spanish, and/or Central or South American indigenous languages (e.g. K'iche', Kaqchikel, Achi, Mam, Chorti, and Quechua/Kichwa) must be available Monday - Friday during regular business hours (9am – 5pm) and asylum interview hours (7am – 5pm) able to travel to the asylum offices in Lyndhurst, NJ and/or Bethpage, NY punctual and reliable (tardiness can have a negative impact on the client’s case) comfortable hearing traumatic stories from children able to maintain strict confidentiality able and willing to take background check have a flexible schedule No interpretation experience necessary, but: must be available to complete a training on asylum interpretation must feel comfortable with consecutive interpretation and sight translation Additional Information: Interviews are usually scheduled two weeks in advance. 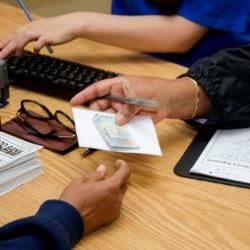 You should have a flexible schedule to attend a pre-asylum meeting and the asylum interview. Asylum interviews are scheduled between 7am – 10am and may last 1 to 3 hours, plus commute time. The interpreter is expected to arrive 30 minutes prior to the interview time and may have to wait several hours before a client is called in for their interview - you will need to reserve the entire day for the interpretation. The volunteer may be asked to interpret twice a month. If you are a student and would like to receive internship credit, please indicate that in your response. We are looking for volunteer attorneys to teach the Tenants' Rights & Responsibilities Workshop under our Tenant Education Program (TEP). Volunteer attorneys are needed to teach workshops on Tuesdays at the Kennedy Center in Harlem (off the 2/3 line -- 34 West 134th Street) from 5:30 - 7:30pm. Volunteer attorneys need only commit to one Tuesday per month. The Program Coordinator will train volunteers in all necessary materials. TEP is a service provided by the Preserving Housing Department of Catholic Charities Community Services. The TEP consists of a series of training workshops covering topics relevant to preserving and stabilizing housing in NYC. We prefer volunteers to have a professional background or practical experience in NYC and NYS housing court legal issues. Through its training workshops, this program aims to transform its participants into tenants who are reliable and preferable to the landlord by helping them: Learn basic knowledge and skills in managing the family budget Identify and practice basic rights and responsibilities as a NYC tenant Understand the need for a cooperative and peaceful landlord-tenant relationship Learn personal skills of communication and conflict resolution in the landlord-tenant relationship Know how to find a safe and adequate apartment in NYC that is affordable and within the tenant's financial means Get informed about rental subsidies and assistance programs provided by the local and federal governments Be aware of potential roots and reasons for eviction/homelessness and how to avoid them Have a glimpse on preparedness for employment and how to become marketable in the job market To facilitate the TEP workshop, we prefer volunteers with a professional background or practical experience in NYC and NYS housing court legal issues. 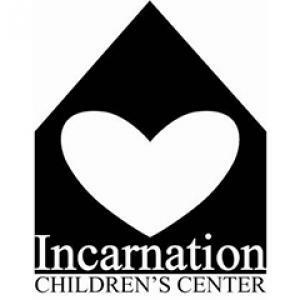 Incarnation Children’s Center (ICC) is New York City's only residence for children with HIV/AIDS. ICC is located in Washington Heights in Manhattan off the 168th Street A/C/1 Subway. ICC is a 21 bed skilled nursing facility. We house residents from birth to 21 years of age who are living with HIV and/or AIDS. Residents are referred to our facility through their medical clinics or other residential facilities. All 21 of the residents live at ICC. Some of our residents go out to school (via public transportation or NYC school buses); a few residents are home schooled; while some of our adult residents have graduated and have not yet found their vocational paths. ICC is looking for volunteers ages 21 and older who are able to commit to giving 3 hours per week for a minimum of 4 months. We are looking for individuals who would be willing to help residents with their homework; engage in recreational activities (i.e. playing sports in our backyard, engaging in the Wii game challenge, ice cream & smoothie night, etc. ); chaperone our weekly facility outings, and most importantly, just to serve as a mentor and role model to our residents. Many of our residents were not expected to live to see their teen years. They had very little to look forward to. Thanks to modern medicine, being born or diagnosed with HIV & AIDS is no longer a death sentence. But, when you were brought up around negativity and little hope, role models are usually few and far between. That’s where you can make a difference. You would be offering normalcy and a sense of what their future could be if they made efforts to be more than what was expected of them upon being diagnosed. Please note: Volunteers are required to pass a medical clearance, which involves showing proof of vaccainations and a PPD test (to determine whether the volunteer has tuberculosis). This is important because of the population of children ICC works with. Help us teach English to the visually impaired! This opportunity is located in Midtown East. The Catholic Guild for the Blind provides a variety of essential services to individuals who are blind and visually impaired, including immigrants who need to learn English in order to get a job or to pursue higher education. Academic services include but are not limited to ESOL instruction, preparation for the high school equivalency (TASC) exam, and preparation for college. 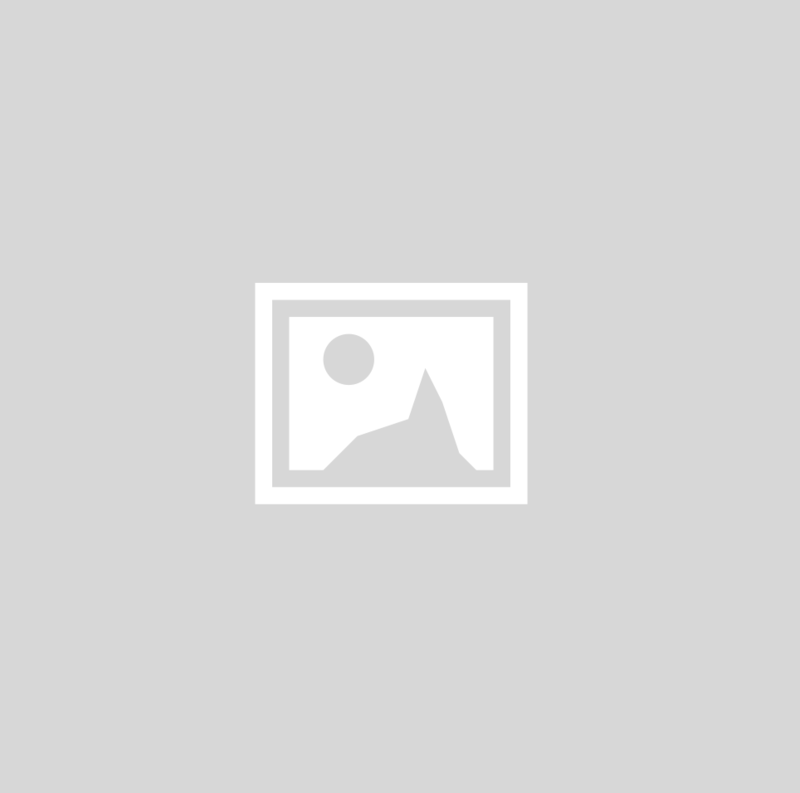 We are an official TASC testing site as well as a TASC prep program that is specifically targeted to those with vision impairments, at present the only such TASC testing site in the State of New York. The volunteer: Will have the opportunity to provide a much needed service to an underserved population and know that they are making a positive, potentially life-changing, impact on those they serve. Will bring the following qualifications and skills: Master’s degree in TESOL, English education or related field Prior teaching experience Ability to develop and implement lesson plans Patience, flexibility, and a heart for working with individuals with disabilities Accurate recordkeeping ability The immediate need is for an ESOL instructor to teach one beginners class once a week and one intermediate class once a week, each two hours per session, for a total of four hours per week. Additional teaching opportunities are available. Please inquire. Teaching Schedule: Tuesdays and Fridays: 11:00 am – 1:00 pm (4 hours per week) Start date TBD. Commitment is 6 months minimum, longer preferred. Volunteer Tasks*: Teach a small group class (2-4 students) – listening, speaking, reading & writing (as needed), grammar, vocabulary Create and implement lessons appropriate to the target population and their goals Prepare materials in accessible formats – large print, audio, Braille Maintain student attendance and progress records Submit documents, including volunteer hours, to academic supervisor as requested *Orientation to working with visually impaired individuals, instruction in preparing accessible materials (large print, audio, Braille), and guidance in lesson planning will be provided, as well as ongoing support as needed. Prior experience in working with visually impaired individuals is not required, though helpful. 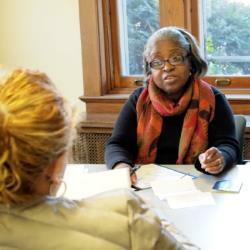 We need volunteers who are willing to interpret at asylum interviews. We are looking for individuals who are: fluent in Spanish or French comfortable hearing traumatic stories able to handle confidential and sensitive information able to travel to the asylum offices in Lyndhurst, NJ, New York City, and/or Bethpage, NY punctual and reliable (tardiness can have a negative impact on the client’s case) able to have a flexible schedule. There is usually a waiting period of several hours before a client is called in for their interview- you will need to reserve the entire day for the interpretation. Interviews are usually scheduled at 8:15am and you must arrive by 7:15am. Ideally, you would also be available to come to the office(s) (Downtown Manhattan or South Bronx) or to meet with the client once before the scheduled interview to get acquainted with the child and the case, but it is not a requirement. 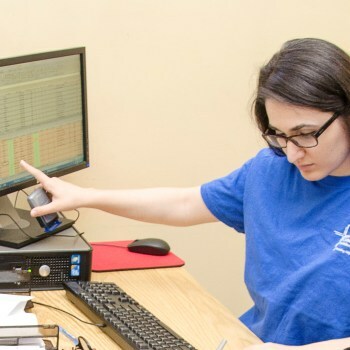 Catholic Charities Community Services: Guild for the Blind https://cccsny.org/services/senior-services We are looking for a volunteer to help with administrative tasks at our Guild for the Blind at the Catholic Center (in Midtown East). When: Monday, Tuesday, Wednesday, and Friday (flexible) Time: 9:30 am-12:30 pm Commitment Request: About 6-9 hours per week Qualifications: Microsoft Word and Excel Training will be given: Outcomes and SYS7 Responsibilities: Perform data entry to track completion of services to our consumers using Outcomes (volunteers will be taught how to use this database). Generate printouts and authorization reports on a weekly and monthly basis from the NY State database, SYS7 (volunteers will also be taught how to use this database). Alphabetize and update (with dates of completed service) hard copies of reports on a monthly basis. Update the Monthly Memorandum Letter (template provided) to the State for Transportation Reimbursement. File as needed. CCCS Catholic Guild for the Blind assists seniors aged 55+ who are legally blind with maintaining independence in their homes. Our staff provides instruction in adaptive techniques to ensure safety in all aspects of independent living.